The annual argument over the politics of the red poppy is well and truly underway. LBC host James O’Brien recently declared that supporters of the far-right have no business wearing the national symbol of remembrance, because they had effectively “switched sides” and become one with the very forces against which Britain battled during the 20th century. From a very different stance, Manchester United footballer Nemanja Matic has movingly explained why he won’t wear the poppy during this weekend’s derby match against City (it reminds him of the NATO bombing of the former Yugoslavia when he was growing up there in the 1990s). And elsewhere, pundits and the public are debating – as they do every year – the fine details of poppy etiquette: who should wear it, who can’t wear it, and for how long prior to Remembrance Sunday should it be worn. As historian Adrian Gregory has explained, her idea was for the artificial poppies to be manufactured in France “by women, for the benefit of children”. In 1921, the British Legion was invited to participate and in 1922 – in order to provide employment for disabled veterans – manufacturing of the poppy shifted from France to Britain and the beneficiaries of the sales were now ex-servicemen in need. The poppy appeal became firmly joined to the charitable fund for ex-servicemen established by the former commander-in-chief of the British forces, Earl Haig. So in many respects, the origins of the poppy appeal are praiseworthy. Yet “praiseworthy” is not the same as “non-political” – and the origins of the poppy appeal in Britain clearly lie with an organisation (the British Legion) and an individual (Earl Haig) who were committed to remembering the Great War in a certain way – as something horrific, yet necessary; terrible, yet worthy. As such, the origins of the poppy are linked to some of the other symbols of remembrance produced by “official” culture in the post-1918 period: the Cenotaph, the grave of the Unknown Warrior and the cemeteries established overseas by the Imperial War Graves Commission (now the Commonwealth War Graves Commission). The sincere (and well meant) statements of the British Legion notwithstanding, there has always been a political side to the poppy. It is this detail that led some to question the red poppy back in the 1930s. In 1933, as governments in Western Europe began to rearm and remilitarise, the Co-operative Women’s Guild started selling white poppies as a symbol of peace. In 1936, the white poppy was then adopted by the Peace Pledge Union (PPU) which still sells it today. For the PPU, conscious of the rising tensions of the 1930s, the red poppy had lost touch with its origins as a symbol of solemn remembrance. Instead, the PPU feared that the poppy had become compromised by resurgent nationalism. So they offered the white poppy in response – to wear it was to identify oneself as a pacifist willing to contest the increasingly disturbing political developments of the years before the outbreak of World War II. 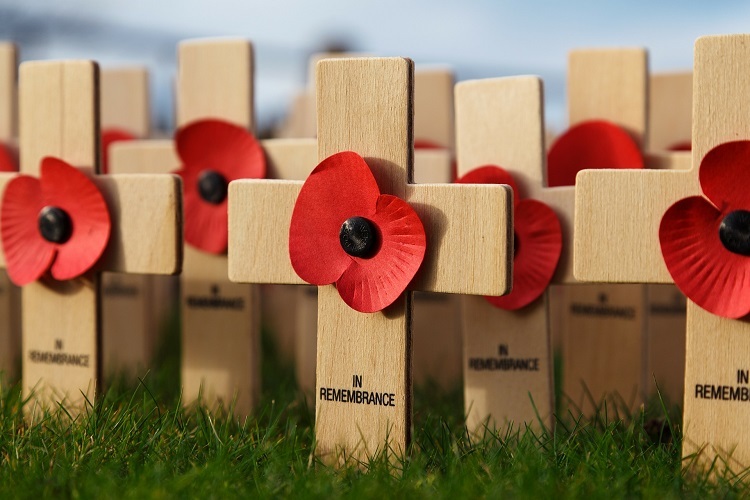 Bearing this long history in mind, what are the key issues as people discuss and decide whether or not to wear the red poppy this Armistice Day, the centennial of the war’s end? First, to buy and wear the red poppy is to associate oneself with almost a century of war remembrance, activity which has always been (and remains) “political”. No society can remember its wars and mourn its dead without ascribing to the violence and victims a meaning. The symbols a society duly produces – including the red poppy – carry an implicit “politics”. Understood in these terms, the fact that some choose on principle not to wear the red poppy is entirely reasonable. To do so is not to insult the dead, but to question the purpose for which it is often said they died. I am profoundly sympathetic to such a sentiment and will quite happily defend the right of people not to wear the British Legion’s poppy (or indeed the right to wear the white poppy in its stead). For those who declare that such acts are unacceptable, I would simply say that if – as countries such as Britain reasonably claim – the wars of the 20th century were fought to defend certain rights and liberties, then part of this was surely the right to dissent, the right to disagree, the right to follow the dictates of one’s conscience. But it is also for this very reason that I will wear the red poppy this Sunday. Not as a mindless expression of nationalist chauvinism, nor in order to simply make acceptable the carnage and catastrophe of 20th-century war. Rather, like so many others, I will wear the British Legion’s poppy as a means to remember those who, on behalf of this nation, have gone to war and not returned. I will wear it to remember all those – soldier and civilian, men and women, adults and children – who have been killed, maimed, traumatised by conflict. And I will wear it because to do so is precisely to engage in a political act while at the same time humbly acknowledging the absolute right of others to do differently, according to their conscience and their politics. Dissent and respectful disagreement are surely the hallmark of a healthy democracy and so, regardless of what you choose to do this Armistice, regardless of whether or not you choose to wear the red poppy, we must all be prepared to accept – and respect – that others might think and act differently.